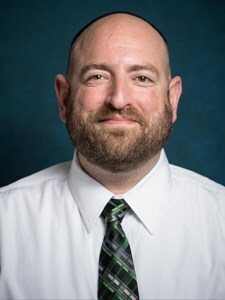 Joe Bednarsh has been the Director of Athletics and Recreation at Yeshiva University since 2006 and has been working at the institution since 1991. He started his tenure working as a lifeguard in the Gottesman Pool and has held every position in the department at some point. Bednarsh has been on campus since 1988 when he was a student at the Marsha Stern Talmudical Academy Yeshiva University High School for Boys. Bednarsh takes great pride that during his tenure as Athletics Director, the women’s athletics program has more than doubled, going from three to seven teams. Additionally, baseball was added as a varsity sport, a full time Sports Information Director was hired, an Assistant Athletics Director specifically for women’s athletics was brought in, full time Athletic Trainers were hired for both campus, all of the fitness centers were refurbished and updated, and additional and better facilities were secured for both varsity games and practices and recreational swimming for the Beren Campus. Bednarsh lives in Yonkers, N.Y. with his wife Lee, his two daughters Jordana (whom the athletes refer to as “YU’s biggest and littlest fan”) and Charlotte, along with his son Ryan. I went to John Jay College to study Forensic Science so I thought I would be collecting and analyzing crime scene evidence. When I found out that I would need to spend 10 hours a day in a lab for 10 years I looked elsewhere because I have to be around people. 2. How many YU teams are there, and how many students participate each year? We have 15 teams 8 for the men and 7 for the women and about 10% of the undergrad population participates on a team. This year is our most successful yet as we set multiple records including our first women’s team (tennis) going to the NCAA National Tournament, Men’s Basketball earning their first bid to the NCAA’s, and Men’s Tennis going to the NCAA’s for the fifth consecutive year! 3.What are some of your goals for the Athletics Department and what progress have you made? I had three goals from the beginning 1) double the size of the women’s program 2) be the pride of the Jewish people and 3) make athletics the type of experience that people would wish they could repeat. I’d say we accomplished those goals. We took the women’s program from 3 to 7 teams, the Maccabees were certainly the center of the Jewish world this year, and there is an electricity about playing for the teams. Moving forward, I want multiple teams competing on the national stage and representing YU and the Jewish people with class and pride. I would love to secure home courts/fields that our young men and women could call home. Imagine if YU had its own facility for all our sports and our student-athletes could play in front of their classmates, teachers, and administration! I also want to continue to lead the conference in academic awards and earn more national academic all-Americans. I love my job. The best part is being with our student-athletes and experiencing the highs (and lows) with them and through their eyes. There are only 4 years where college-aged kids can participate in NCAA athletics and the fact that I am able to provide an opportunity for our kids to compete and excel without sacrificing their beliefs makes my job meaningful. No one could do what the Maccabees do – all the studying, class time, religious practices, and still they defeat opponents of evcery type. There are no other students like ours and I shout it from the rooftops. I think people would be surprised to know that I spent most of my youth kickboxing and never ever picked up a basketball until I was 15 years old.